The modem must support the list of AT commands for handling text messages. The text message receiving plug-in checks the modem for compatibility during the initialization. If the modem is not compatible, no text messages will be received. If the modem is connected via the Ethernet, USB, Bluetooth interface or some other interface, drivers that create or emulate the modem COM port must be installed for this modem. The speed value does not usually matter for these modems. It is possible to configure advanced modem options on the "Advanced options" tab (fig. 2). 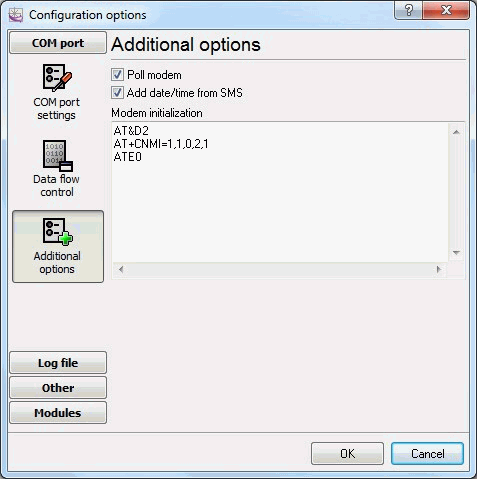 Poll modem - if this option is enabled, the plug-in will query the modem every 3 seconds for new text messages. This mode is used if the GSM modem cannot notify the computer when a new text message is received. In this case, the modem is configured to send notifications to the computer when a new text message is received. This command affects the process of receiving messages and receipt reports, if it is specified incorrectly problems with receiving them may occur. That is why it is recommended to make sure that parameters of this command correspond to the documentation of your modem. It is also possible to use other commands to optimize the operation of modems. Below you can see the instructions how to preliminarily configure modems using Hyperterminal (the standard Windows program) or any other terminal software. 1. Connect the modem to the computer and wait till it is registered in the GSM network. 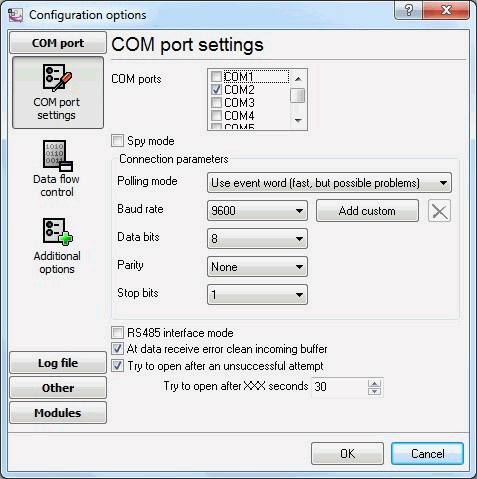 Configure the modem port speed (as a rule, 9600 or 19200 bps), open the port. the response is +CMPS: "SM",0,20, "SM",0,20, "SM",0,20. If the response is different (for example: +CMPS: "ME",0,20, "SM",0,20, "ME",0,20), use the AT+CPMS="SM", "SM", "SM" command to enable the necessary configuration. 5. Save this configuration to the modem profile using the AT&W command. 6. Use the ATZ command to reset the modem and send the AT+CMGL=4 command (the response is OK or the list of saved text messages) to make sure that you have specified the correct settings.